The biggest reason I say it was a win for me is because I am very nearly finished with my first draft of the ebook -- which is turning out to be somewhat shorter than I anticipated, but I think my expectations were off since I was doing it during NaNo. 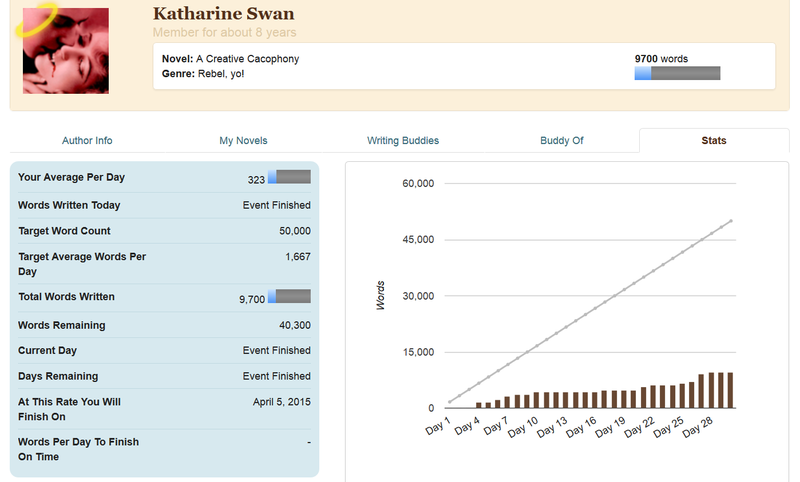 I finished up several short sections last night, after midnight though, so the word count didn't go onto my NaNoWriMo graph. It's not great, but at least it's a fairly steady climb most days. And like I said, I am almost done with the first draft of my ebook. I had wanted to at least finish the draft, which is why I consider it "almost winning," at least for my own goals. I do have something in the works to try to get myself writing every day year-round -- NaNo is a great short-term motivator, but I need something for the rest of the year, too. I want to be in a good habit of writing every day by the time Camp NaNoWriMo comes round again in April!